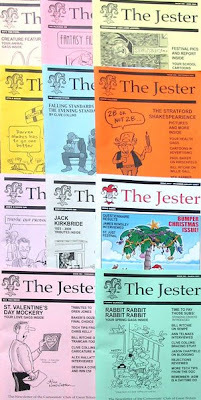 I don’t blog here as often as I’d like to because a) obviously I spend quite a lot of time thinking up and drawing cartoons and b) a fair amount of my spare time is taken up with being editor of The Jester, the newsletter of the Cartoonists’ Club of Great Britain. I took this pic for the club’s recent Members’ Directory, it shows a year's worth of issues, from April last year to March (there’s no January issue). With remarkable restraint, only one of the covers is by me. The rest are by Alex Noel Watson (two covers), Terry Bave, Matt Buck, Clive Collins, Tim Harries, Louis Hellman, the late Jack Kirkbride, Ian Ellery, and Dave Parker. I get paid to edit The Jester, but it’s not very much. I do enjoy doing it though. I was a journalist for 10 years, many of them as a sub-editor, at the Press Association, Daily Mirror and The Times. While I enjoyed the job a lot of the time, I would often find myself working with subject matter in which I had absolutely zero interest. Here I have a whole magazine on my favourite subject: cartooning!